rif and I decided to try Hokano for lunch yesterday. Located just a few rows after Maybank, it is actually a very small outlet, only half a shoplot. Once seated, I ordered the Chicken Katsudon while rif went for the Mix Fry lunch set. 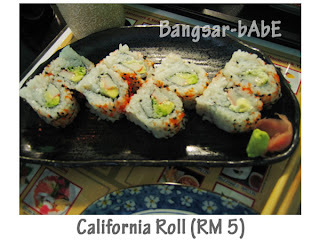 We also ordered a plate of California Roll and Sushi Tamago Roll to share. The food took slightly more than 30 minutes to arrive. The Chicken Katsudon was quite a generous serving and tasted as delicious as it looked. The rice was piping hot and came with plenty of sauce, onions, mushrooms, a big piece of deep-fried breaded chicken, egg and seaweed garnishing. I love the slightly runny texture of the egg. Tasted superb when mixed together with the rice. Really good stuff! 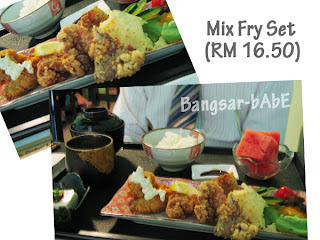 rif’s Mix Fry Set (with miso soup, chawanmushi and fruits) was not bad. The chawanmushi was really good. Silky smooth egg custard with bits of mushroom and chicken, every mouthful was a pleasure. I kept sneaking some from rif. The batter was light and beautifully coated the chicken and fish. Very crispy and delectable. The extra mayonnaise topping made it sooooooo delish. I also liked the potato salad that came as a side. Very moreish! A pity they only gave a small serving of that. The California Roll was well made and neatly presented on the plate. Crabsticks and avocado wrapped in seaweed and fluffy pearl rice and coated with ebiko and bits of sesame seed, it tasted very good. The creamy avocado melts in your mouth, creating a harmony of flavours especially with a tease of shoyu and wasabi. The Sushi Tamago Roll was average, maybe because we were already wowed by the California Roll. The bill came up to RM 40.95 (no service charge or tax) including 2 cups of green tea for the both of us. All in, it was a good meal and very reasonable indeed (for good Japanese food). Don’t expect good service as it is a no-frills dining place. However, it is WORTH THE WAIT. Verdict: Good Japanese food, reasonable pricing. I will be back real soon. 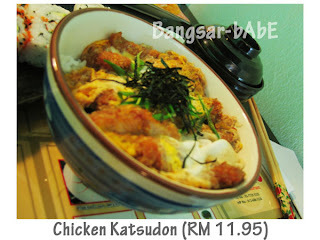 Katsudon…chawanmushi…wait for me!! i would say that this is one of the very few place that serve quality jap food unlike many found in Malaysia which tend to be watered down. they do not skimp on the raw materials used to make the jap food. Hokano is the most value for money with great quality food you could ask for. No ptetentious malaysian trying to speak or greet you in less than accurate japanese! Me and wifey's fav place as i sometimes just take away as snack. Try the hokano roll and rainbow roll and even the crispy salmon skin roll. Dont forget the softshell crab!!! They renovated 3weeks back and now occupy the whole shop with the same no frill and unassuming ambience.